After I thought the whole slew of new unlimited data plans from all the carriers had subsided, Sprint is back again with some more news. Like before, this seems like the best deal of the bunch on the surface (if Sprint's network coverage in your area is good). However, the pricing you'll see in the graphic below is a limited time promotional deal — meaning that the price climbs after a certain time. Oh, and it's only available to new customers. As with all of the carriers, the price-per-line decreases as you add more to your account. A $5 auto-pay credit is also factored into all of this. But in case you're having a hard time reading the fine print there, I've taken the liberty of typing up the important bits for you all. "Sprint Unlimited Freedom: Savings until 6/30/18, then $60/mo. for line 1, $40/mo. for line 2, $30/mo. for lines 3-4. Includes unlimited talk, text, and data. Data deprioritization during congestion after 23GB/mo. Pricing shown with $5/mo./line AutoPay discount applied within 2 invoices. Reqs. eBill and new account activation. Other monthly charges apply. Sprint, Verizon, AT&T pricing excludes taxes and fees." $120 for four lines doesn't sound too bad, right? In the grand scheme of things, that is a good price while it lasts, even if it's Sprint. When the promo ends (June 30, 2018), you will end up paying $180/month for four lines, which brings it in line with T-Mobile's ONE plan... until you remember that Sprint's deal doesn't include taxes and fees while Tmo's does. Not to be confused with Sprint's previous unlimited announcement (which ends tonight, according to the press release), this one has a bit lower pricing on the second line, but higher overall — if you'll recall, that promotion came out to $22.50/month for four lines. It also only lasted through March 2018. Unlimited Freedom starts tomorrow, April 7, for new customers. Again, it looks like Sprint is only concerned with getting new subscribers, not with keeping the ones it has. We'll see how well that works out. OVERLAND PARK, Kan. (BUSINESS WIRE), April 06, 2017 - Sprint (NYSE:S), the first wireless carrier to offer unlimited data, talk and text, today announced new pricing for its Unlimited Freedom plan and the elimination of other rate plan offers. This new plan continues to offer the best price for unlimited among all national carriers. Verizon and AT&T unlimited plans are 50 percent more! Unlimited Data, Talk and Text for $50/month for the first line. Two lines for $40 month/line. Four lines for $30 month/line. A fully featured unlimited plan that includes HD streaming for video, music and gaming, and 10GB/month per line of mobile hotspot data. There’s no denying that the demand for unlimited has skyrocketed. With more sophisticated smartphones, innovative apps and an explosion in the popularity of social media, wireless customers need – and want – unlimited more than ever. And with its spectrum advantage and the capacity of its network, Sprint is best positioned to handle customers’ needs in an unlimited world. Sprint has more spectrum than any other carrier in the U.S. With holdings of more than 160MHz of 2.5GHz spectrum in the top 100 U.S. markets, Sprint has the right kind of high-band spectrum that is built for data and very fast speeds. This is a tremendous advantage, allowing Sprint to keep adding the capacity and speed needed to meet customers’ increasing demand for data now and well into the future. Perfect for unlimited. Sprint’s previous Unlimited promotion ends tonight, and the company is retiring its well-known “50% off” and moving away from its “Better Choice” metered plans. 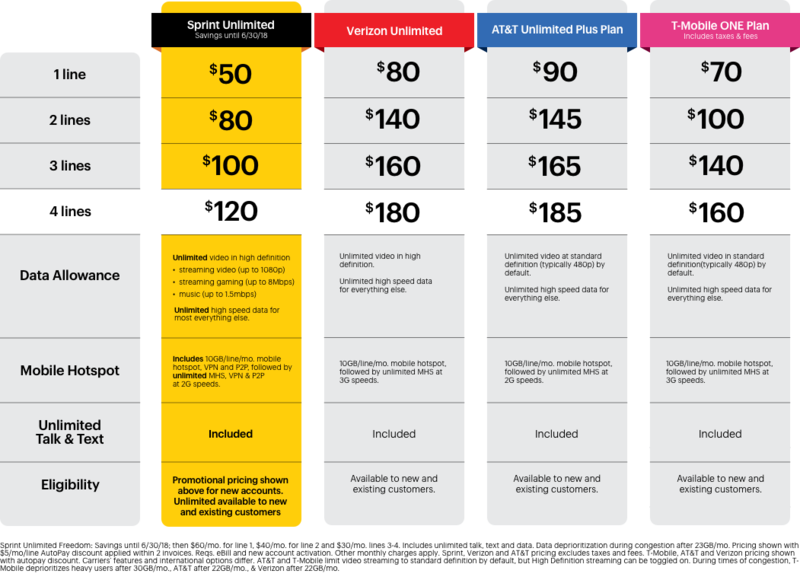 With this bold move, Sprint is making wireless pricing easier for the consumer…and, as always, providing a compelling reason to switch. Harry Wang, senior research director-Parks Associates, applauds the simplicity of Sprint’s Unlimited offer. “Sprint has been the only mobile operator in the U.S. sticking to unlimited data plans for customers all these years,” Wang said, “and the simplicity of unlimited data plan negates individual service features, such as data rollover or zero-rating video service. The return of unlimited plans from all major U.S. mobile operators is good news for consumers, and also reflects operators’ growing confidence in their network." Unlimited is also available to business customers, who can sign up for an unlimited number of lines.